I have become a bit of a fingerless gloves pattern connoiseur. I made my first pair of fingerless gloves about 10 years ago. I rarely used quality yarn at the time. I tended toward middle end acrylics...think Michael's and Wal-Mart. Then, I had this friend who wanted to learn to knit Fetching fingerless gloves by Cheryl Niamath, and she had found these lovely skeins of yarn online for $18. I almost choked, but...I splurged, for my friend's sake. Thus began my affection for fine things - especially fine yarn. I still only splurge on fine yarns occasionally. (I have a mountain of second-hand acrylics I use to make blankets and items for donation...projects I work just to keep my fingers moving.) 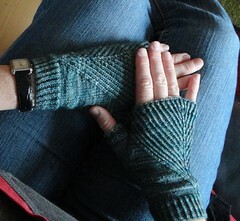 When I do splurge on a high end skein, I love to make fingerless gloves. They feel so nice on my hands on a spring or fall evening. They keep me warm and keep my fingers free, so I can continue knitting...or typing. And above all, I love to give them as fine gifts to my precious friends. Here is a collection of the favorite fingerless gloves patterns on my to-do list. Enjoy! Sometimes simplicity is the best option. Camp Out Fingerless Mitts by Tante Ehm on Ravelry are rated as an "easy" knit with a very high rating. Kara Stanley makes it easy to see why knitters are so happy with the results of this free knitting pattern. These gloves are simply lovely! They will definitely be in my queue, and I think I will splurge on the Noro yarn to get the most delectable results. It's hard to believe Linda K's Yummy Mummy Wristwarmer's is offered as a free knitting pattern by Alexandra Brinck on Ravelry. 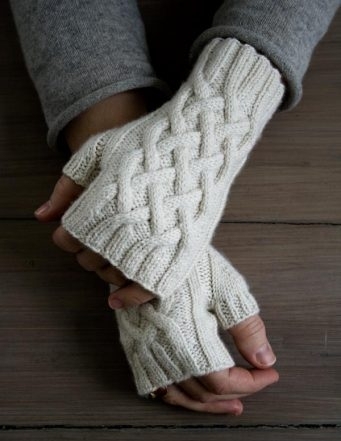 The lovely cable works make the gloves look like a complicated, delicate work of art. The quality yarn choice shines through in the beauty of these fingerless gloves. I was shocked when this fingerless gloves image came across my Pinterest feed. The diagonal rib is a delightful play on the eyes. Ravelry reviewers give fingerless gloves pattern, Straightforward Mitts , by Mone Dräger a high 4.5 star rating and a low difficulty score. Tracybug offers a sweet image of the diagonals. I think I will pick out a high quality yarn and give this free knitting pattern a go. Unforgettably feminine. Pink yarn adds to the delicacy of the playful cables on these fingerless gloves. I love the detail on the thumb gusset, an area that is rather typically ignored. The free fingerless gloves knitting pattern, Roosa Ruusu ,by Emma Karvonen is a must knit for my future. 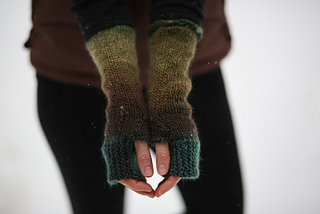 I love the fingerless gloves pattern, The Hand of Friendship Fingerless Mits by Kandipandi. The eyelets give the pattern a delicate look of complexity. The picot bind off makes the edge of these gloves appear royal - crowning your hands with delicacy. The pattern offers an option for shorter gloves, and one ball of the angora merino wool makes two pairs of fingerless gloves. Knit one for a friend. Knit one for yourself! Handed Yes, Fingered No - Mitts that Fit is a simple, but lovely fingerless gloves pattern offered free by Ellen M. Silva. The pattern boasts the stripey technique, which I had to research further. It is apparently a "jogless stripes" knitting technique, and since I am all about learning new things, I may have to practice it out on these lovely mitts. 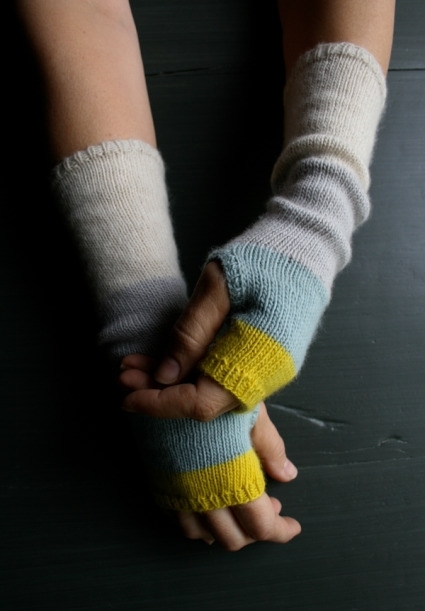 Top 1 reason to try their lovely yarn: 1) This free knitting pattern, Colorblock Handwarmers, by Purl Soho. I am a little hesitant with the longer cuffed fingerless gloves patterns. I have some serious texture sensitivities...but...I really hate sleeves, and this yarn IS light, merino. So, I'm betting they could stretch out my short sleeves season, and they would feel pretty great. I just love the simply elegant thumb "gusset." Purl Soho offers several suggested color schemes in the pattern. I think I like this one the best! 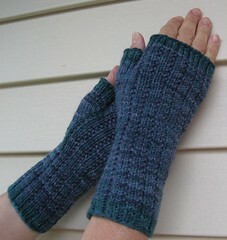 While we are on the topic...here is another free fingerless gloves pattern by Purl Soho - Traveling Cable Hand Warmers. It's not every day that I am up for complicated knitting, but when I am, you'd better believe I am going to use a delightful, fine yarn. This pattern is written for extra fine merino wool with 20% mulberry silk...a textural explosion in my hands, I'm sure. I'm not one to hide behind neutral colors, but there are several other choices available. (I'm feeling Super Pink or Tumeric Yellow). This pattern is very similar (multicolored fingers and all) to my ABSOLUTE, very, very favorite pair of gloves EVER...honestly, I loved these gloves. I bought them at a store...not hand knit...and they had this little overlap that went over the thumb but could be "kicked back" easily. Unfortunately, the thumb eventual began to unravel (after many years' wear), and though I fixed it several times, there came a day these gloves were beyond repair. I still have them tucked away in a knitting drawer, in case I ever decide to write a pattern to knit them. (I had a favorite pair of shoes that wore out once, too. I allowed myself to take a picture of them before I finally made myself throw them out.) I was so excited when I fell upon this fingerless gloves Magic Mitts pattern by Rosie on Sew and Sew. This is on my Must Knit Soon! list. My final fingerless gloves free knitting pattern is Jacoby offered by Berroco. I love the stripes. I love the ribs. I love the thumb gusset. Oh!...and WHAT?! !...I researched a little deeper and found that this is a self-striping yarn. I think I am in love. Must try Berroco yarn and make the Jacoby! *Caution...the yarn may be hard to find. It looks like it was a limited time only yarn in 2007, but I found several options for buying recently. Search "Berroco Lang Jawoll Yarn." Otherwise, we may have to find a substitute. Feel free to comment to add your favorite free fingerless gloves pattern links to the list. I will update as I make my way through these patterns. Happy Knitting! Hello Kristen. I am a Pastor from Mumbai, India. I am glad to stop by your profile on the blogger and the blog post. I am blessed and feel privileged and honored to get connected with you as well as know you through your profile on the blogger and the blog post. Your post blog showing different fingerless hand gloves are so beautiful. I am blessed and feel privileged and honored to get connected with you as well as know you and about your life's desire expressed by Philippians 3:8 and Gal 2:20 I love getting connected with the people of God around the globe to be encouraged, strengthened and praying for one another. I have been in the Pastoral ministry for last 38 yrs in this great city of Mumbai a city with a great contrast where richest of rich and the poorest of poor live. We reachout to the poorest of poor with the love of Christ to bring healing to the brokenhearted. We also encourage young and the adults from the west to come to Mumbai to work with us during their vacation time. We would love to have you come to Mumbai to empower women in the slums in knitting such beautiful gloves. I am sure you will have a life changing experience. My email idis: dhwankhede(at)gmail(dot)com and my name is Diwakar Wankhede. Looking forward to hear from you very soon. God's richest blessings on you, your family and friends. Well, I finally fell onto the wagon. I have fallen in love...with Harry Potter. Honestly, after finishing the series, I don't know why it took me so long. My darkest fears of being snatched into the sacrilegious, have been completely eradicated. In fact, I've stumbled upon many embedded biblical themes in the magical, albeit fictional, world. I have to admit, I'm glad I saved the series for now. This year is the exact year that I desperately needed to escape into an amazing fictional world...to leave behind my own challenges, triumphs and heartbreak, for a bit, and enter into someone else's. Harry's world has given me respite, and more...many new things to knit! Here are the best (and most realistically worth my time) Harry Potter Knitting Patterns - Free I have found. The baby blanket is the perfect solution. The first one I made for my son (which was blue and did not include a border). I loved the scallop in blanket form so much, I decided to make it a pattern. I chose to make the pattern blanket larger than my son's - it is about twice as big and can grow into a lap blanket or a spread for a toddler bed. Some people like to plan carefully and get things right the first time. I am impatient, and I just want to knit. So, when my daughter asked me for a sweater. I just dove right in. Here's the thing. I don't really know how the yarn will fall until I try things out. And I am 20 years in on this whole knitting thing. I long ago realized I am WAY more into the process than the product. So, I don't mind ripping out and starting over until I get it right. I mean...immediate frustration upon realizing I've knit for about 8 hours and it's not going to work is imminent. But then, I just shake it off and remind myself, "Well, that just means more knitting for me!" And, oh. That's a good thing. This project started out as a request. 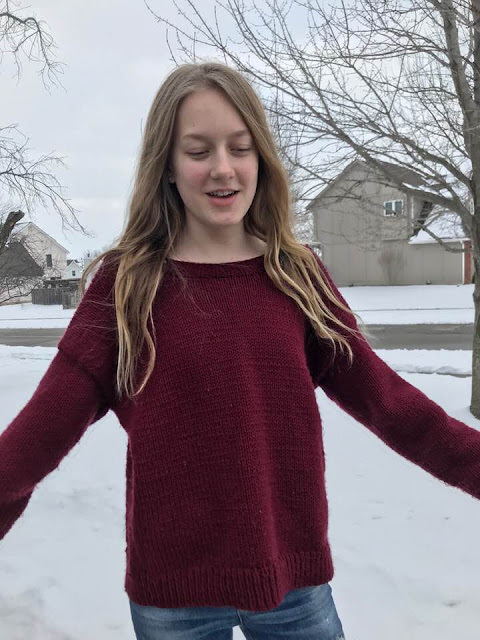 My 14 year old daughter wanted a sweater. Now, I have just about had it with requests from my kids. Because I have knit an untold number of items that were seldom used. That is ever so frustrating.